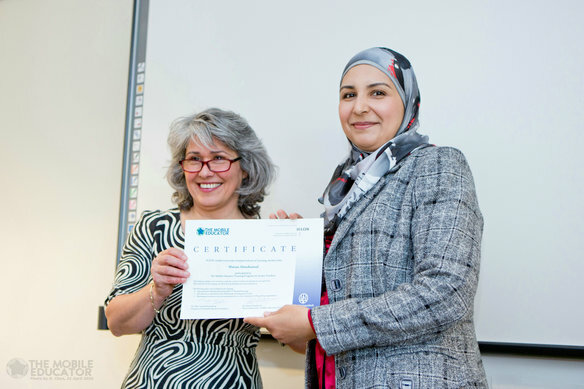 The first session of The Mobile Educator was closed with a festive presentation of the certificates. Your contribution helped to reach this result! On April 21, 2016 16 teachers received their certificates of participation in the first session of The Mobile Educator. The meeting was not only a closure, but also the beginning of new initiatives that help refugees on their way in Dutch society. The participants gave presentations where they often looked back on what they have experienced in Syria, and also presented their plans for the future. ‘I have only been in the Netherlands for seven monts, and now I have this certificate. Great!’ Says a physics teacher. 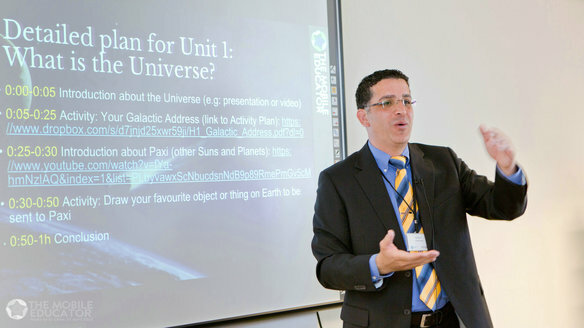 In collaboration with Universe Awareness, and together with three Syrian colleagues, he developed a series of lessons about the universe. They will give these lessons to children in asylum centers this summer. An English teacher is using educational websites for her lessons. She keeps in touch with her students through the online learning environment Moodle. In this way, the lessons can simply continue as she or her pupils are transferred to another reception center. Four students have developed courses on intercultural communication together with teachers from De Haagse Hogeschool. In June, the will give these lessons during an internship at the Food and Nutrition department. The first training session is over, but that does not mean The Mobile Educator comes to a halt. One of the follow-up projects is the plan of The Mobile Educator bus: some Syrian teachers want to travel with a bus to asylum centers to educate young people on the spot. This plan will be developed further. The next training of The Mobile Educator is scheduled for August. 30-03-2016 | 17:47 Ahmed .